↑ Horvitz, Leslie. Eureka! : Scientific Breakthroughs That Changed The World. New York: John Wiley. 2002. 43. ISBN 9780471233411. OCLC 50766822. ↑ Newlands, John A. R. On Relations Among the Equivalents. Chemical News. 1864-08-20, 10: 94–95. ↑ Newlands, John A. R. On the Law of Octaves. Chemical News. 1865-08-18, 12: 83. ↑ Bryson, Bill. A Short History of Nearly Everything. London: Black Swan. 2004: 141–142. ISBN 9780552151740. ↑ Mendelejew, Dimitri. Über die Beziehungen der Eigenschaften zu den Atomgewichten der Elemente. Zeitschrift für Chemie. 1869: 405–406. ↑ Pullman, Bernard. The Atom in the History of Human Thought. Translated by Axel Reisinger. Oxford University Press. 1998. 227. ISBN 0-19-515040-6. ↑ Atkins, P. W. The Periodic Kingdom. HarperCollins Publishers, Inc. 1995. 87. ISBN 0-465-07265-8. ↑ Adloff, Jean-Pierre; Kaufman, George B. Francium (Atomic Number 87), the Last Discovered Natural Element. The Chemical Educator. 25 September 2005 [26 March 2007]. ↑ Hoffman, D. C.; Lawrence, F. O.; Mewherter, J. L.; Rourke, F. M. Detection of Plutonium-244 in Nature. Nature. 1971, 234 (5325): 132–134. Bibcode:1971Natur.234..132H. doi:10.1038/234132a0. ↑ Barber, Robert C.; Gäggeler, Heinz W.; Karol, Paul J.; Nakahara, Hiromichi; Vardaci, Emanuele; Vogt, Erich. [IUPAC]Element 112 is Named Copernicium. Pure and Applied Chemistry (iupac.org). 2009, 81 (7): 1331 [2010-06-12]. doi:10.1351/PAC-REP-08-03-05. 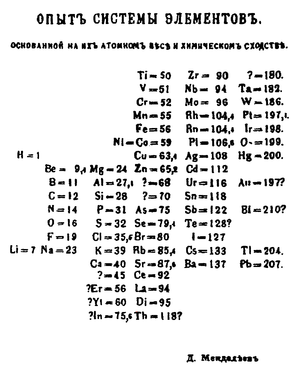 ↑ Barber, Robert C.; Karol, Paul J; Nakahara, Hiromichi; Vardaci, Emanuele; Vogt, Erich W. Discovery of the elements with atomic numbers greater than or equal to 113 (IUPAC Technical Report). Pure Appl. Chem. 2011, 83 (7): 1485. doi:10.1351/PAC-REP-10-05-01. ↑ Emsley, John. Nature's Building Blocks: An A-Z Guide to the Elements New. New York, NY: Oxford University Press. 2011. ISBN 978-0-19-960563-7. ↑ Koppenol, W. H. Naming of New Elements (IUPAC Recommendations 2002) (PDF). Pure and Applied Chemistry. 2002, 74 (5): 787–791. doi:10.1351/pac200274050787. ↑ Haire, Richard G. Fermium, Mendelevium, Nobelium and Lawrencium//In Morss; Edelstein, Norman M.; Fuger, Jean. The Chemistry of the Actinide and Transactinide Elements 3rd. Dordrecht, The Netherlands: Springer Science+Business Media. 2006. ISBN 1-4020-3555-1. ↑ Painless Learning Placemats: Periodic Table of the Elements. M. Ruskin Co. 2000. 2. ↑ Dynamic periodic table. Ptable.com. 2011-10-06 [2011-10-30]. Ciā hiĕk-miêng sê diŏh 05:02, 2019 nièng 2 nguŏk 18 hô̤ (Bái-ék) có̤i-hâiu siŭ-gāi gì.